With an aim to stand tall on the expectations of patrons, we are engaged in manufacturing, supplying and exporting Temperature Scanner & Data Logger. The offered range comprises Temperature Scanner, Data Logger and Safe Temperature Scanner. 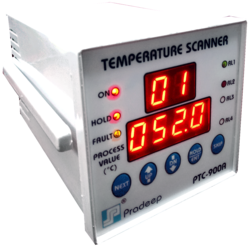 Patrons are augmenting the demand for provided temperature scanner & date loggers as these are manufactured under the supervision of professionals by making use of the premium quality raw material. These temperature scanners and data loggers are durable and ensure smooth performance. With an aim to ensure the safe operations of dry type transformers and oil filled transformers, we are engaged in offering Temperature Scanner. Power transformers function in high temperature conditions, so it is necessary to ensure their supervision. For the same purpose, our offered temperature scanners watch the temperature of transformer windings and core. PT100 temperature sensor help supervise the temperature of the three phase windings, core and other critical point of the transformer. To ensure the protection of power transformers, avail from us Temperature Scanner. Offered temperature scanners are used for the dry type transformers or oil filled transformers. Since these transformers work in high temperature conditions so it becomes important to supervise the temperature of transformer windings and transformer core. To ensure that provided temperature scanners are able to suit the above named application, we manufacture these temperature scanners by using high grade raw material. Along with this, for SCADA application, analog output of 4 – 20 mA signal of winding temperature is provided. 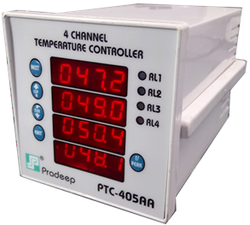 Pradeep’s Temperature Scanner is useful for the protection of power transformers. The scanner has been designed for the safe operation of cast resin/ dry type transformers or oil filled transform. Normally this type of transformer operates in high temperature conditions, hence it is highly essential to monitor the temperature of transformer windings, transformer core etc. Our temperature scanner has been specially designed to suit this purpose. The Temperature Scanner has four settable alarm set-points to warn the user of very high temperature condition and tripping of the transformer in case of excessive heating as well as to facilitate effective control of the transformer cooling. It provides peak temperature indication also.